Want Cute Selfies? Try This. Maybe you’re already cute. Or pretty. Or handsome. Whatever. But perhaps you’re not photogenic. Here’s a surefire way to correct that. 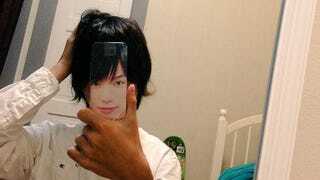 Twitter user Nickkoara loves taking selfies in the mirror and decided to stick the face of actor Sota Fukushi on the back of a smartphone case. His original photo was retweeted over 20,000 times. So, yeah! Just measure a photo accordingly, cut it out, and affix it to your phone. As Nickkoara points out, this would also work for anime characters, should that be your thing.